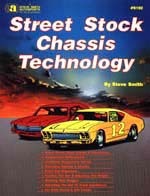 Everything you need to know to build, set-up and race a Street Stock competitively. Includes: Performance handling basics, chassis & roll cage fabrication, front suspension alignment, changing the roll center and camber curve, rear suspensions, springs and shocks, tires (bias and radial), stagger, gearing, basic chassis set-up for asphalt and dirt tracks, weight adjustments, tuning the car to track conditions, and more! 160 pages, 243 photos and drawings. For dirt and asphalt tracks. SPECIAL PACKAGE: Buy both the S192 book and V191 video for only $62.95.